Gorilla trekking in Rwanda, Uganda or the Republic of Congo–watch for my upcoming blog about Uganda soon! Looking for ideas for your next adventure? Call for a free 20-minute consultation, 602-923-1542. Comments Comments Off on Looking for More Adventure on Your Vacation? Whether you are a travel aficionado or someone who is just getting ready to step into the cultural diversity of our world, there is little doubt that you’ve heard of the beauty of Italy. Often listed among the most beautiful countries in the world, it is considered a top destination for any tourist. If you’re the type to envision a classic, romantic setting with a dimly lit atmosphere as your ideal vacation, you’ll probably want to consider visiting Italy because it will surely satisfy your expectations. The country is overwhelmingly rich in art and history, as it contains the very city where Shakespeare set the famous tragedy of Romeo and Juliet— Verona. Other than its capability to host romantic getaways, it can also excite history buffs, serve as a wellspring of inspiration for writers or painters, and entertain those who simply want to appreciate various architectural structures, sculptures, literature, and many more historic pieces of art; some of which include ornate, Baroque architecture, masterpieces by Leonardo Da Vinci, Michelangelo, and a Roman amphitheater. From exploring the home to one of Europe’s oldest universities to the ancient ruins of the Romans, the many cities of Italy will provide you with such an exceptional sight-seeing experience, you’ll feel as if you’ve been teleported into the fifteenth century, during the Renaissance Age. And if this wasn’t enough to pique your interest, it is also the home to one of the most iconic buildings you’ve seen in photos— the leaning tower of Pisa. It’s spectacular in pictures, but even more so in person. As you explore the graceful, cobblestoned streets of Italy and, with every passing second, breathe in more of the rich aura of Italy, you may find this aura almost tangible as it seeps into every city and corner, permeating the entire country with its vivid artistic array. It is no wonder it is considered by many people to be a dream location for their honeymoon, or anything romantic in that matter. When you’re both aiming for a passionate, candle-lit dinner, having one in this picturesque country won’t require much effort on your part, as Italy would act as a naturally tender atmosphere. Luckily, there are numerous agencies designed to provide you with a custom Italian vacation, where travel experts and managers will assist you in planning your perfect trip. Lake Garda – is located farthest to the east and is the largest lake in Italy. The water is clean and great for swimming, fishing and boating. It boasts natural hot springs water that is piped to two villages on its shoreline. One of these spa towns is picturesque and medieval Sirmione, located on a peninsula on the southern shore – less than one hour from beautiful Verona and next door to the Valpolicella wine region. Consider the Villa Cortine Palace Hotel for a luxurious stay in a tranquil park setting with glorious lake views. 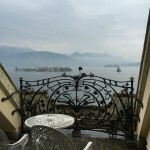 Lake Como – lies directly north of Milan about one hour by train or car. Surrounded by beautiful mountains, it has the largest concentration of beautiful villas on its shoreline, which were largely built during the heyday of the silk business in this area. The southern and middle portions of Lake Como are dotted with charming villages as well as the bustling town of Como to the south that has a lovely historic center, great shopping, two train stations, and plenty of great dining options. This is the hub for the public ferry systems that run throughout the lake and even offers a seaplane port for transportation “uplake” or to nearby lakes and scenic sightseeing. Great hiking trails abound all around the lake, some quite challenging. Accommodations range from simple boutique hotels to luxurious villa hotels that you will not want to leave. 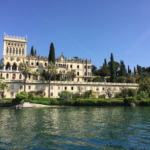 Lake Maggiore – is the second largest of the lakes in this region and has several lovely islands, all of which are privately owned by the Borromeo family except one. 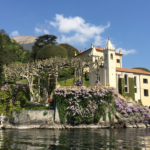 Two of their islands, Isola Madre and Isola Bella, have beautiful gardens open to the public, with Bella also offering a villa to explore – both of which are well worth a visit. This lake is great for swimming and boating, as well as other water activities. Other activities include golf, a scenic train, shopping, hiking, and a visit to nearby Piedmont wine region. The Villa & Palazzo Aminta awaits you if you are looking for a luxurious and relaxing stay. These lakes are easily reached by car (Lake Garda from Venice or Verona to the east, Lakes Como and Maggiore from Milan to the south) or by train. Driving is not for the faint of heart in this area, however, as roads are very narrow and many are very windy with lots of congestion (especially Lake Como). You may want to consider arriving by train then having a private transfer or car/water taxi to your hotel. When you hear about traveling to Italy, a lot of people would think of Rome, Florence, Venice, or Milan. These are some of the most popular cities to explore in Italy but the country has more regions to offer. Italy is a very beautiful country filled with historical sites worth visiting. There’s Rome, Venice, Florence, Milan, Naples, Verona, Turin, Bologna, Peruvia, and Genoa. These are considered the best places to go to in Italy being the most famous tourist destinations. However, there are smaller regions you can visit and explore while in Italy. The Versilia Coast & the Cinque Terre are two interesting places just on the other side of Tuscany. The Versilia Coast has beautiful and expansive beaches while further south are the five cliff-sided villages of the Cinque Terre. You can enjoy these areas by traveling from village to village by train or by a walking trail. The name Versilia is derived from Vessidia, the ancient German word for water (Wesser/Wasser). Climate in Versilia is usually temperate (mild). This makes it an ideal holiday destination by locals and foreigners visiting the city. Expect about 270 sunny days with pleasant warmth. During winter, it can be cold but you won’t experience any biting cold. The most populated and most famous part of Versilia is Pietrasanta. It is located at the foot of the Apuan Alps, extending along the coastline, from South to North, starting at Stazzema and ending up to Marina di Massa. The old or Historical Versilia consists of four places: Stazzema, Seravezza, Pietrasanta, and Forte dei Marmi. Versilian territory includes both mountain and the sea. It boasts of the longest sandy beaches in Italy. One of the impressive sights in Versilia is the whole range of mountains called the Apuan Alps. It spreads as far as the north-west of Tuscany. There are about 200 caves in the mountains and some of them tourists can visit with special guides. Liberty Style in art is very much evident in Versilia. It started in 1905 but in 1917, Art Deco came to life. You’ll see examples of Art Deco style in Villa Arrighi and Villa Argentina. You can enjoy a lot of local cuisines in Versilia: Luca, Pisa, Massa Carrara, and Genoa. The Cinque Terre are situated in the region of Liguria. It is close to Genoa and the boundary of Tuscany. Cinque Terre landscape was formed by a series of folds that results when rocks were pushed, raised, and pressed together during the Tertiary period. There are five villages forming the Cinque Terre: Riomaggiore, Manarola, Vernazza, Corniglia, and Monterosso. Want to visit Versilia Coast and the Cinque Terre? Contact Gateway Destinations and we’ll plan a custom tour just for you.